das Blog: Schloss Schönhausen: Du riechst so gut! Schloss Schönhausen: Du riechst so gut! The mother-in-law and nephew are visiting us for a few days, but where to go when the weather is as cold as a witch's proverbial? We decided on visiting the newly renovated Schloss Schönhausen, in nearby Pankow, which was opened to the public (for the first time since before the Second World War) on December 19th 2009. This small castle - well, country house really - has a fascinating history. It was originally built in 1644 in the Dutch style for the Gräfin (Duchess) Sophie Theodore zu Dohna-Schlobitten, who was born into the house Holland-Brederode, when she acquired lands in Niederschönhausen and when Pankow was a long way outside the Berlin city walls. But you don't need to know that, as the most famous royal resident of the castle was Queen Elisabeth Christine. 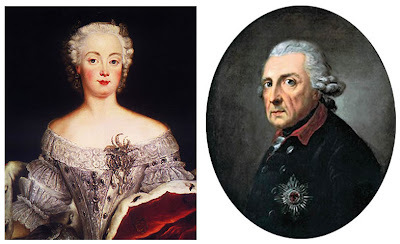 Elisabeth Christine's husband, in what is generally considered as a marriage of political convenience, was Frederick the Great of Prussia aka König Friedrich II of House Hohenzollern. Reading between the lines, the story seems to be that the eighteen year old Freddy had attempted to flee the clutches of his tyrannical father (another Friedrich, Friedrich Wilhelm I, the so-called 'soldier king'), together with his confidant Lieutenant Hans Hermann von Katte and a young page-boy named Peter Karl Christoph Keith that Freddy had become rather ah-hem fond of. They were heading for England and got as far as Mannheim when Peter's brother Robert had a panic-attack about what was happening and spilled the beans to King Fred I. The young prince's father went ballistic, imprisoned the mutineers in Küstrin (now the split Polish border town of Kostrzyn) and charged Freddy and Katte with treason, which carried an automatic death penalty. The King eventually gave Freddy a pardon, but not before making him watch Katte's be-heading 'leaving the crown prince to faint away and suffer hallucinations for the following two days.' As well it might. Anyway, the king made young Freddy stay at Küstrin and 'learn the details of rural and city administration from the officials of the town' whilst meanwhile orchestrating his marriage to Elisabeth Christine of Brunswick-Bevern. The crown prince wasn't at all happy about the arranged marriage and contemplated suicide. "There can be neither love nor friendship between us," he wrote to his sister, but never-the-less the wedding took place on 12th June 1733. As soon as his father died in 1740 and he became King, he prevented his wife Elizabeth Christine from ever visiting him at his sumptuous Court in the newly built Palace Sanssouci at Potsdam, and gave her Schloss Schönhausen as her Summer Palace (otherwise she had apartments at the Stadtschloss in Berlin). From then onwards the two only met at family get-togethers, and King Freddy never visited Schloss Schönhausen. Needless to say, they never had any children. Strangely, it is recorded that EC remained devoted to her husband all her life. Nowadays King Frederick, or Alte Fritz as he became known, is mostly remembered for introducing potatoes into Brandenburg, though he did much more than that and built Prussia into a formidable fighting, cultural, and economic force. Poor Elizabeth Christine is hardly remembered at all, so it is fitting that the displays in the Schloss are now devoted to her life and achievements and helping to redress the balance. Elizabeth Christine seems to have been the soul of the Schloss; and so with her death in 1797 the palace fell into disuse and seems to have been used by the Hohenzollerns somewhat as we might use the loft for storage of old carpets and unloved paintings. When the German monarchy was abolished after World War I, the Schloss and its landscaped, English-style, gardens became property of the Free State of Prussia, and were opened to the public with a tea-room and art exhibition area. When the National Socialists in turn abolished the Free State of Prussia, the building was radically modernised and the Reich's Art department moved in. It became the storage and burial place for works that the Nazi's considered 'degenerate art' or 'entartete Kunst': this was a term that covered just about all modern art, including that done by such immoral sociopaths as Picasso, Emil Nolde, Henri Matisse, van Gogh, Otto Dix, Marc Chagall, Max Beckmann, Max Liebermann, and so on and so on. Schloss Schönhausen suffered some damage during the Battle of Berlin but was quickly patched up by an artists' initiative from Pankow. It was then soon confiscated by the Red Army and used as first an officer's mess and then as a boarding school for Soviet students. Pankow and the Schloss were in the Soviet sector of Berlin of course, and when the GDR (DDR) was founded on 7 October 1949 Schloss Schönhausen became the official residence of the President, Wilhelm Pieck. When Pieck died in 1960 and the seat of government moved to central Berlin, the Schloss was renamed Schloss Niederschönhausen and became a guest house for visiting dignitaries to the GDR. It was a strange feeling going into a bedroom on the first floor and finding out that here slept such people as Fidel Castro, Indira Gandhi, Muammar al-Gaddafi, Yasser Arafat, Nicolae Ceauşescu, and its last residents Mikhail Gorbachev and Mrs Gorbachev. I didn't reckon much to their en-suite bathroom though; a retina-tearing lilac-purple tiled monstrosity that was perhaps the height of fashion in Sixties DDR, but clashed somewhat with the elegant gold and white mouldings of the sitting room. truly a 'Bad - bathroom' as the German/English sign said. During the time of the DDR, the Schloss and its gardens were separated from the hoi polloi by a high wall and security gates, so it is excellent that finally (exactly twenty years after German re-unification) the house and its grounds are open to us proles again. It was also good to find shelter from the stinging snow blizzard, though as a sign on the entrance said, the Schloss isn't heated. Never mind, at least the floor isn't compacted ice like outside! The ground floor is given over to exhibitions about the life of Elisabeth Christine. There is little by way of contemporary furnishings - most of it being successively plundered over the centuries - but the restoration has recreated enough of the baroque plaster decorations, paintings, fireplace surrounds, gilded mirrors, wallpaper, and floor parquetry to give enough of an impression of what it might have looked like. The crystal chandeliers and the amazing sweep of the staircase between neo-classical columns in the high-windowed entrance hall set a tone which is carried on to the first floor. Here is the magnificent ballroom, with views out onto the gardens and gold-framed mirrors bouncing the pale Winter light around the crystal lights. The first floor though is mostly given over to the Schloss' history as a GDR guest house, and hence the unfortunate purple bathroom, the worst but not the only preserved Sixties innovation. The staircase continues wonderfully up to the top floor, but there is little reason to go up there unless you are really really interested in the building materials and techniques of rennovating an old property. I sort of get the impression that the purpose of the exhibition was more to prove to the tax-payers of Pankow that they were getting their money's worth by the restoration. Also, here the information boards are all in German whereas for the rest of the house they were in English too. They did however promise the addition of a cafe in the future, which would have been most welcome today. But in the absence of suitable warmth-giving refreshment, we braved the snowstorm outside once more and made our way to Pankow shopping centre for hot coffee and Apfelstrudel. So, why have I sub-titled this post 'du riechst so gut'? Well, back in April 1998 the Schloss was opened up to let a certain group by the name of Rammstein make a video here. The result was one of my favoritest R+ videos for the track 'Du riechst so gut', which gives me an excuse to post it here! Watch out for the indoor dance-floor scenes which were filmed at the Schloss, and that amazing staircase again. 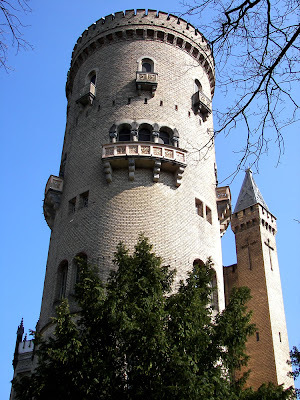 The outside scenes, by the way, were photographed at Schloss Babelsburg, which ironically is just across the Havel from Freddy's Sanssouci in Potsdam! Postscript: the House of Hohenzollern and Prussian/German royalty didn't just vanish at the foundation of a German republic after WWI. The descendants of Alte Fritz's family (though not Freddy himself) are still around. The current head of House Hohenzollern is Georg Friedrich Ferdinand, 'seine kaiserliche und königliche Hoheit, der Prinz von Preußen'. He is also, because of the way all the monarchs of Europe were inter-related and I wouldn't be surprised if Queen Victoria has something to do with it, 152nd in line to the throne of England. As if anyone except readers of OK Magazine care nowadays. Wow, what a great blog!! I live just around the corner from Schloss Park, I've been researching to find out more about it, and I'm so glad I stumbled upon this! Thank yoU!